"May every dip of your paddle lead you towards a rediscovery of yourself, of your canoeing companions, of the wonders of nature, and of the unmatched physical and spiritual rapture made possible by the humble canoe"
Canoe Tripping is the quintessential Canadian summer experience and an amazing opportunity for character development for everyone involved. Canoe Tripping is a traveling camping trip by which you paddle from lake to lake, portage (carry) your canoes over land between lakes; all the while carrying your food, tents and equipment with you. Canoe Tripping is an amazing activity for growth in mind, body and spirit! Body – a canoe trip is excellent exercise as you canoe daily for hours, hike with heavy gear and busy yourself around the campsite…you are constantly active. Mind – a canoe trip is a test of the human spirit as your group travels from one lake to another, overcoming all of the challenges that are found in the great Canadian wilderness. However, through hard work, perseverance and working together as a team the only way to move on a canoe trip is forward. At the end of a canoe trip, lifelong friendships are born and everyone feels an astounding sense of accomplishment…leading to a tremendous feeling of self worth and courage. Soul – while many aspects of a canoe trip involve hard work, there are just as many opportunities to enjoy the peace and tranquil beauty of our natural world. 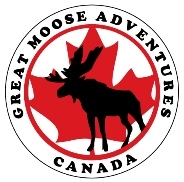 What makes the Great Moose Adventures canoe tripping program so special? Our canoe guides are qualified outdoor educators. Our trips are adaptable to meet the needs of all campers. Each camper will have individual learning/character development goals to work on throughout the trip. Nutritious meals, with ability to meet individual dietary needs. High safety standards and mature, experienced canoe guides.